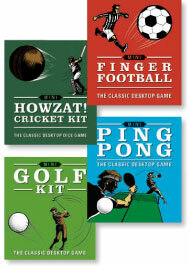 We’ve created four highly popular kits for Running Press, UK – the Howzat!, Football, Golf and Ping Pong desktop ‘minis’. Each kit features a small-format paperback book – with tips on training and techniques, fun facts and trivia, and more – together with items relevant to the particular game, from dice and a rolling surface for the Howzat! cricket kit, to two pairs of finger ‘boots’, goal posts, a ball and a pitch for the desktop football kit. The Mini Golf Kit comes with its own mini fairway, complete with bunkers and sand, and mini golf clubs and balls.